MRIRN3L1 is the Nimbus-3 Medium-Resolution Infrared Radiometer (MRIR) Level 1 Meteorological Radiance Data product and contain radiances expressed as equivalent blackbody temperature or "brightness" temperature, along with geolocation, time and other housekeeping information. 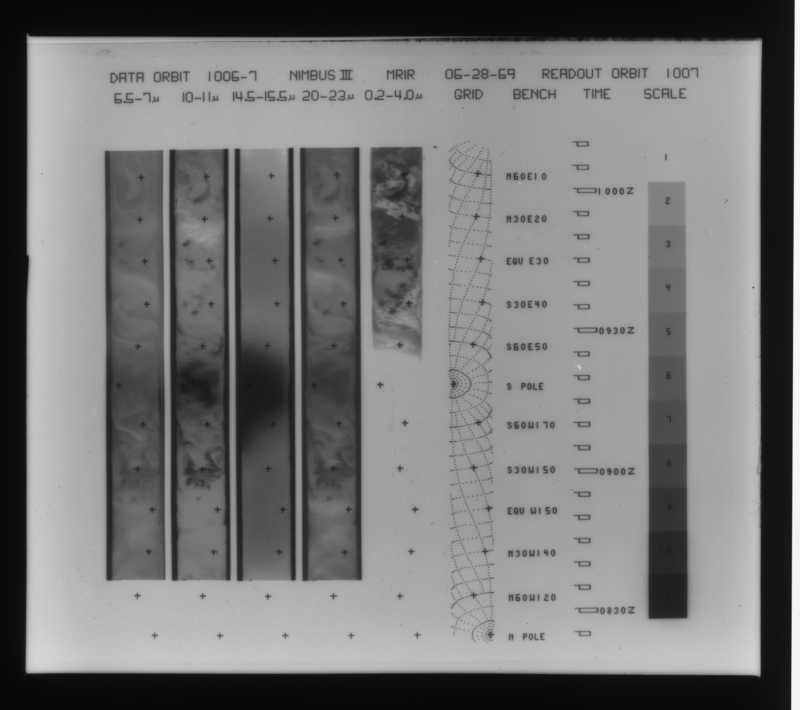 The data, originally written on IBM 360 machines, were recovered from magnetic tapes, also referred to as Nimbus Meteorological Radiation Tapes (NMRT). The data are archived in their original IBM 36-bit word proprietary format, also referred to as a binary TAP file. The MRIR instrument was designed to measure infrared electromagnetic radiation emitted and reflected from the Earth and its atmosphere at 5 wavelengths. The five wavelengths regions are as follows: (1) 6.5 to 7.0 microns - This channel covers the 6.7 micron water vapor absorption band. Its purpose is to provide information on water vapor distribution in the upper troposphere and, in conjunction with the other channels to provide data concerning relative humidities at these altitudes. (2) 10 to 11 microns - Operating in an atmospheric "window," this channel measures surface or near-surface temperatures over clear portions of the atmosphere. It also provides cloud cover and cloud height information (day and night). (3) 14.5 to 15.5 microns - This channel, centered about the strong absorption band of C02 at 15 microns, measures radiation which emanates primarily from the stratosphere. The information gained here is of primary importance to in following seasonal stratospheric temperature changes. (4) 20 to 23 microns - This channel yields data from the spectral region containing the broad rotational absorption bands of water vapor. It will provide information similar to that of the 6.5 to 7.0 micron channel except that the flux will largely be radiated from lower in the atmosphere. (5) 0.2 to 4.0 microns - This channel covers more than 99% of the solar spectrum and yields information on the intensity of the reflected solar energy from the earth and its atmosphere. These data were previously archived at NASA NSSDC as product NMRT-MRIR under the entry ID ESAD-00183 (originally 69-037A-05B). Created by: McCulloch, Andrew W., et al.